LMS Chairman: Is the EF dangerous to souls? A number of people have commented on the Fisher More College situation, saying that the Bishop's banning of the Traditional Mass on campus is a response to various Bad Things happening in the college. Exactly the same thing has been said about the Franciscan Friars of the Immaculate. The people who say this often add that banning the EF seems an odd way to address the problems, and I agree. But while I don't know if the claims about the motivations involved in either case are true, I would like to address the idea that frequent attendance at the Traditional Mass can be a danger to your soul. This argument was often hinted at before Summorum Pontificum, and if it is making a comeback that is a little worrying. A brief autobiographical note. 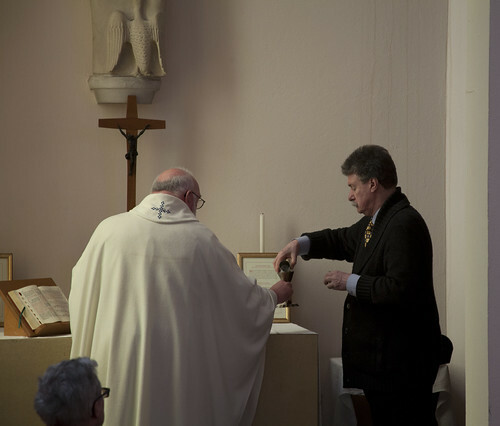 As I've mentioned before, for a number of years I attended the Novus Ordo in Latin. I bought myself a little booklet with the Latin and the English side by side. After a while I noticed something rather strange. Here is the booklet I used to use, open at the bit in Eucharistic Prayer I (the Roman Canon) immediately after the Eucharistic Acclamation. The Latin is on the left, the English, the official 1974 ICEL translation, on the right. The weird thing is that the Latin text is a lot longer than the English translation. It is exaggerated by the fact that the Latin is divided into more paragraphs than the English, and uses shorter lines, but closer examination reveals that a large number of words and indeed whole phrases were not being translated. Now this is the scandal of the 'old ICEL' translation which has now been addressed by the new translation. At what cost of effort and conflict, we all know, and we must be grateful to Bl John Paul II and Pope Benedict XVI for persisting with it. Because what 'old ICEL' said was this: there had been a concerted effort, accepted if not instigated by the very highest authority in the Church - let's not say, 'conspiracy' - to present a systematically one-sided - let's not say, 'falsified' - version of the Church's liturgical tradition. If you get into this, if you start reading about it, you realise it neither began nor ended with ICEL. And I don't mean reading books written by tin-foil hatted trads; the strongest dosage of conspiracy theory-stuff can often be found in the books of triumphalist liberals. In this frame of mind, it can be a huge relief to go to the Old Mass, the Vetus Ordo. It can feel as if, for the first time for a long while, one is able to stop worrying about the political meaning of every detail, and just pray. What happens in Mass is, essentially, what the Church has done for centuries. It happens simply because the Church has done it for centuries. I don't mean it has no meaning, I just mean that the priest hasn't decided that because of his personal views this meaning is good and let's do it today. He is doing it in accordance with Tradition. Those attending can stop campaigning for more Latin, for fewer Marxist bidding prayers, or to stop the Extraordinary Ministers wearing skirts which make genuflection either impossible or indecent. They can just participate in Mass and develop their spiritual lives. We used to hear a lot about our desire for the Traditional Mass being a 'personal preference', with the implication that this was a bad thing. I can't help being amused by this. Have those who use this phrase not noticed the role of personal preferences in celebrations of the Ordinary Form? I am by no means saying that everyone who attends the Traditional Mass has gone through this mental process. I do think, however, that the ones which people - perhaps including Bishop Olsen of Fort Worth, Texas, or Fr Volpi, the Commissioner of the Franciscans of the Immaculate - are most worried about, may well have. The ones who those people worry might end up with the SSPX or as sede vacantists; the ones who get a bit worked up about these things. What I want to say is this: those people, the ones who get worked up, are not going to be helped by being deprived of the the Vetus Ordo and forced to go to the Novus Ordo. If they are really worked up, it is more likely to drive them even more nuts. For them, Pope Benedict's liberalisation of the Extraordinary Form was truly pastoral: it made it possible for them to remain in the Church in a serene fashion, and to make spiritual progress. To calm down, in fact. Attending the Traditional Mass may make people realise that the Mass has changed rather radically, and this may start the train of thought I described above. But any contact with reality can do that: looking at the religious art in an art gallery, reading about the history of the Church, looking at old church buildings. You can't hope that people will never realise that the Mass used to be said in Latin and ad orientem. What you can do is to make the point, as Pope Benedict did, that however much has changed, the Church has not repudiated the past. What was sacred in the past is sacred now; what was doctrine in the past is still doctrine now. This relieves us of the necessity of double-think, which actually drives you mad after a while. Suppose the wretched Franciscans of the Immaculate are as bad as their critics claim; suppose the wretched Michael King, President of Fisher More College, is as bad as his critics claim. For heaven's sake don't deprive them of this spiritual solace, of the Traditional Mass. It is cruel, it is unjust, and it will make whatever theological or political problems there may be much, much worse. 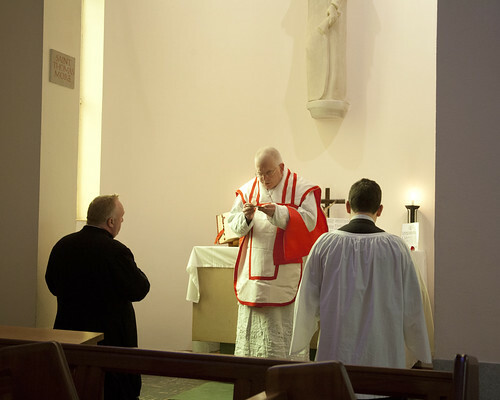 Photos of Low Masses celebrated during the LMS Priest Training Conference in Leicester in 2013. I learned more about liturgy by sitting alone in a library reading 19th century missals and breviaries and books of ceremonies, making my own translations and photocopies, than I ever did attending services. For anyone with a serious interest in liturgy and not being part of a clique this is really the best way to learn. Reading about liturgies is wonderful, but of course you learn more by participating in a liturgy than by sitting in a library. Do you think you learn more about fishing by reading about it in a book or by fishing? And I'm sorry if you've been going to the wrong church.. I go to Vetus Ordo, the proper Mass, and there are no cliques there. Everyone is extremely reverential and focused on worshiping Christ. The Novus Ordo "puts the focus on the people". In order for the focus to be put on one thing though, doesn't it have to be taken off of another? If the focus is on the people, then, by definition, it is not on Christ. I have noticed that participation in the Tridentine Mass effects a change in both the celebrant as well as the congregation. Although, my 'sample' is too small to be statistically significant. The tendency is to form a strong preference for the Tridentine Mass. To the point where 'proselytizing' occurs encouraging others to attend. I am thinking of a young Jesuit in which this change was effected. Once the cultural prejudice against the Tridentine Mass has been removed, the next step appears to be at least a willingness to examine the reform in contrast with the pre-conciliar liturgy. I believe the next step is examining the council from which the reform emanated. Mr. King and the FFI seemed to reach the same conclusions , whether or not their paths started at the Tridentine Mass we know the change tbat exclusive use of the Tridentine Mass effects. As someone attached to the ancient form of the Roman Rite I have felt increasingly marginalised of late. Pope Benedict spoke of us having been treated like lepers in the past and I feel this is increasing anew. All sacraments can be a danger to a soul. Even baptism, which is the gift of a new life, can be a club used to justify mistreatment of the non-baptised. Confession is essential, but to someone who suffers from scrupulosity it can be treacherous and lead to either despair or extreme pride (i.e. Luther). But just because even the greatest good can lead to destruction, does not mean that all good should be banned. To do so would be to be engaged in the work of the devil. If there is an imbalance, correct it don't ban it. Here's a question: as a relatively newly ordained Jesuit priest, should I offer the Mass in the EF? My NO masses are about as by the book as they can be and avoid the problems most EF fans complain about. I'm geographically close enough to a parish that offers Mass in the EF (mostly by Jesuits) so I don't see how (other than helping cover EF Masses for my brother Jesuits) I am contributing to anything good by offering Mass in the EF instead of the NO. Maybe I'm even depriving the majority of a good NO Mass. Before I was ordained I liked the EF more than the NO only when no good NO was to be found. Wouldn't I be a bit guilty of furthering divisions by contributing to a sense that the only guaranteed "good" Mass is one in the EF? I am certainly not settled on this for myself so any constructive comments are appreciated. Why must it be one or the other? Many parishes have more than one mass per day. At two oratory parishes in my city, on Sundays they offer a proper English NO, a latin NO, an EF low mass, and a EF high mass. Granted the above mass times are likely more than you can handle, but offering the a proper NO at 11pm and the EF mass at a time other than the "competing" parish is like the best option. Not only does offering the EF help ensure that your NO doesn't drift towards the common denominator, it also encourages people in your parish to "take a chance on the EF". But don't be surprised if on Solemnities more people go to the EF than NO. Even parishes that shun Latin and incense seem to have a soft spot for them during Christmas, where the day demands extra reverence. I see your point. I work in a high school with a daily Mass, say Masses at a convent a few times a week, and do supply work on occasion. I guess for my situation it is a question of whether or not I should work to introduce the EF where no one is really attached to it. I have already gotten a few NO Mass parts to be sung in Latin (Sanctus, Agnus Dei and a closing Salve Regina) and Greek (Kyrie) and everyone really seems to appreciate it as far as I can tell. So my question is still centered around advantages and disadvantages of the EF where almost none of the Mass attendees are accustomed to it and the NO form is guaranteed to be as good as a NO can be. To answer your first question, yes, you should. You have no idea how much good you will be doing by offering it. Thank you. Can you articulate for me the advantages of the EF over the NO that I already offer given my situation? I am sincerely trying to work this out and I could use some perspective. Fr. John, why not start offering one of your daily Masses in the EF for your high school students? It would be a very good thing for your high school students to learn about the liturgical traditions of the Church. It would be most edifying for your students and I think it would be very good for you as well. Many young people come to love the EF Mass easily. But they can't know they love it till they come to know it! Please feel free to give this treasure of the Mass as freely as you can. In addition, there may well be many people who go to your Masses that are interested but keep that interest to themselves, and I can guarantee you that if you offer the EF Mass some people will come to love it! You seem to be approaching your question from a utilitarian perspective ('What good would I accomplish ...?'). One could contend that the EF is the true Mass ('The Mass of All Ages') and should be celebrated for that reason alone. But even if you wish to consider likely benefits, there are didactic considerations galore in favor of the EF. 'One believes as one worships.' Assisting at an EF Mass for about a year has taught my family, including my son, who is considering the priesthood, a lot about our faith, the most important lesson being that one is at Calvary during Mass, not the Upper Room, which is the mistaken impression that I got from the NO. David. Thanks! The reasons you offer are pretty good. Maybe I'm too insistent that my experience of the EF (a good option to ensure less liturgical distractions, but not really better for someone who has a good NO option available and isn't already attached to the EF) is the experience of everyone. I am assuming the people coming to the daily NO masses I say already love the liturgy in the NO and it is as likely to scare people away as attract them if the EF is offered instead. Some things for me to chew on... Thanks again! Robert, you are right. I am assuming the NO and EF are the same Mass but in different forms. I certainly relate to the original post, that the EF insulates the average person from distracting liturgical abuses. But you make a good point that "sacrifice" is emphasized in the EF more than the NO which can point more to Eucharistic "meal" etc... Thanks. Fr John, if you have a 'day off' and celebrate a private Mass, why not make it the EF? And see if over time it makes a positive contribution to your own spiritual life. A utilitarian reason would be that you never know when you might be called on to celebrate an EF funeral, for example, perhaps at short notice. It's a skill priests should have, if they can. Excellent idea. I celebrate Mass alone about once a month and the reasons you give certainly justify my mastering the EF. It's only my procrastination and the daunting learning curve that has held me back when it comes to saying Mass in the EF in private. Keep me in your prayers! As Mr Shaw has pointed out and the point I wanted to post was this; You are a Priest of the Holy Roman Catholic Church, you are a Latin Rite Priest. Due to this fact alone is a reason to know the EF. This Mass belongs to you, this Mass is another "tool" in your "toolbox". This is part of your patrimony and you should not be denied this! Now the procrastination is something I most certainly can relate to. Christopher, thanks. You should get to know more Jesuits. The EF is popular with many! And looking at the men in formation, it might even get more so. Father Brown, I am so encouraged by your interest in the EF mass. Personally, I returned to the Church specifically because of the EF mass. I was attending the NO masses in our area but feeling something was wrong with me. I was just not feeling close to God. Then I ventured to a near by city to a FSSP Latin Mass parish and was blown away. It was totally transforming. Why, I don't know, it just lifted my spirit to God in a way nothing else ever has. Another thought is this, would it be possible for you to, maybe once a month, drive to an area where the EF is not offered on Sunday. Where I live there are about 30 of us who drive an hour or more to attend the EF mass. Sadly there has been at least one person killed during this journey. If we could find a priest interested in making the drive to our area at least once per month, we would pay for his training, his drive, of course some kind of a stipend and love him for his kindness. Our Bishop says that no body is available to say the mass for us, so we are out of luck. If this is the case hear in Colorado, I am sure there is a similar group near you. I also very much admire your using the Latin in the mass. I wish we had one mass like that in our city, but sadly, one of our previous bishops would not allow any Latin to be used. I hope you know what a wonderful thing you are doing by adding the Latin to the Mass. It does tend to lift our hearts to God (I don't know why, but it does). I know many priests who have experienced a sense of positive growth after celebrating the EF. Many do so only in private but value it incredibly. As others have said the sense of sacrifice is more pronounced. One other comment I hear is that the priests confiteor is a powerful moment in the Mass. I think those are good considerations. The forceful switch in the 1970's must have been painful for many people (I recall reading that Tolkien refused to say the responses in the vernacular and loudly answered in Latin). There is no need to inflict this again on anyone. However, I do think there is a difference of ethos/spirit between the OF and EF liturgies, just as the Byzantine liturgies are different. I am personally most at home in the Roman EF liturgy and I'm certain there are such people in your parish as well. Probably not enough to justify disturbing the stable routine, but most likely enough souls to make the attempt of adding it somewhere on the weekly schedule (if possible) worthwhile. Right now the more EFs celebrated the better, because it is still common to hear comments about it being foreign, non-participatory, laity-as-mere-spectators, private celebration of the priest, etc. That is nonsense for anyone who has attended more than just 2-3 EFs, but sadly theological arguments often don't work, but a beautiful traditional Liturgy might! Wider availability would also stop the EF from being used as a weapon in political/ecclesiastical battles between liberals/conservatives/traditionalists. I am under no illusion that these conflicts will disappear anytime soon, but it's just awful to see the liturgy used for this end. Somebody also made a good point about tradition. What are we without tradition but just another random Protestant denomination? Adherence to prior tradition should be natural for Catholics, but if you look up various surveys about orthodoxy and orthopraxis then you realize that it simply isn't. 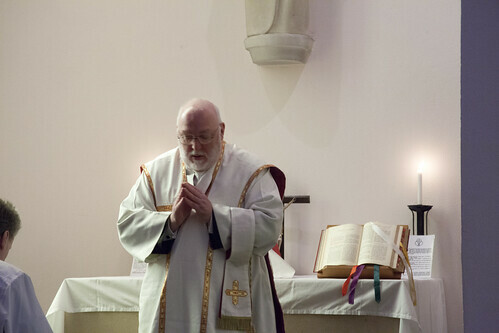 I think the current Tridentine rite has kept the ethos (language, prayers, ad orientem celebration, gestures, liturgical seasons, feasts, octaves,...) largely intact and in line with the previous iterations of the Roman Rite. Thus it is much more easier for people to recognize themselves as part of our great Latin Tradition - lex orandi, lex credendi! And finally, this is related to the point about availability, but I actually don't think that the 1962 Missal is the best form of the post-Trent Roman Rite. For example, the 1955 Holy Week reforms of Pius XII seem at least very questionable to me and there are other somewhat experimental/transitional features. But right now, for us of the Traditional Latin Rite, it is '62 or nothing. Once we stop being looked down upon as weird, suspicious and possibly disloyal then we can carefully examine the changes between 1570 and 1962 without fear. I also think that the Novus Ordo experience shows that some degree of freedom for adaptation must be allowed. People will just do it, even without permission. Local traditions have been the norm prior to the invention of the printing press, so I don't think this would be bad and contrary to tradition. However, again right now it is impossible to examine this. The traditional Mass is a danger - to ignorance, confusion, complacency and compromise in respect to the Faith and morals. That is why the enemies of the Faith and of morals hate it.